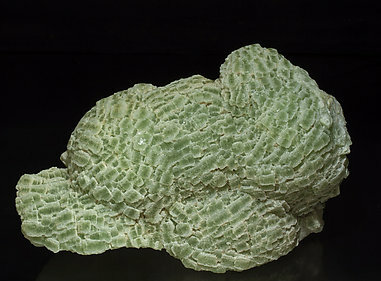 Globular fan-shaped growths with visible faces, translucent, with a uniform clear green color and on an ophiolite matrix. The quarry has been closed and inaccessible for years. 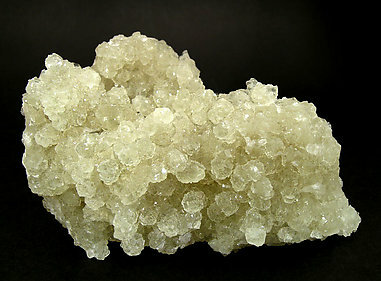 The crystals have a globular aspect due to curved faces and edges. They have a soft clear greenish yellow color and an intense luster. They form a practically floating druse, except for a little fragment of Orthoclase on the back, where the specimen was fixed to the rocky matrix. Globular light green aggregate, with well defined and very bright crystal terminal faces. These brilliant specimens are quite unusual in this closed quarry. On matrix. The sample is very intense green and forms globular growths consisting of prismatic crystals of simple forms and very well defined. 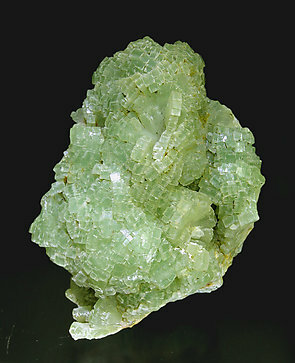 Actually disappeared from the market, it is difficult to obtain good Prehnite from this locality. Aggregate of crystals with polycrystalline growths and very well defined forms. They are translucent, bright and have a very intense and uniform color. 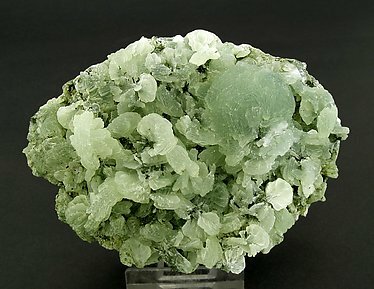 The sample has the usual high quality of the good Brandberg Prehnite, but its size is bigger than usual. Group of prismatic crystals of excellent definition, uncommon for the species. A novelty at St. Marie 2013. 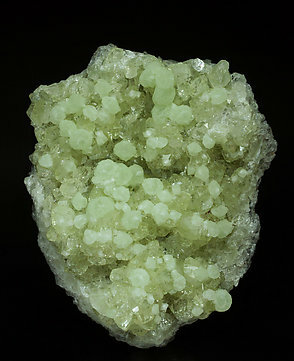 A globular aggregate of prismatic crystals with very well defined faces and edges, color zoned with a whitish green color on the outsides and a more intense green color in the middle. 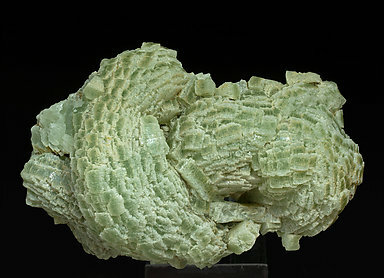 Globular aggregates of short prismatic crystals with very well defined faces and edges, slightly curved terminations and color-zoned with a whitish green color on the outsides and more intense green color in the center. A novelty at St. Marie 2013. 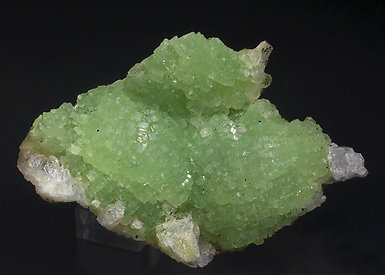 Globular aggregates of prismatic crystals with very well defined faces and edges, whitish green color and brighter slightly curved terminations with more intense green color. Very aerial spherical growths. They are translucent and with a green color that changes its intensity, it passes to whitish on the smaller spherules at the base. Spherical growths of laminar crystals on a serpentine matrix. We especially note the rich green shades of the group. 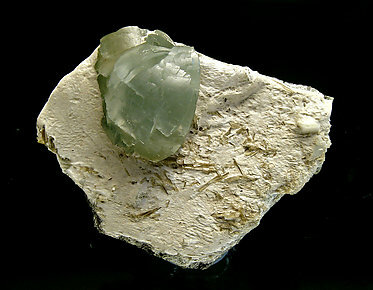 This Prehnite is from a classic locality and good specimens are very scarce today. 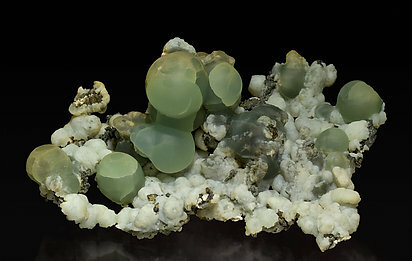 Beautiful globular growths of Prehnite with central cavities occupied by Augite in groups of acicular crystals. Augite is also omnipresent on the whole surface of the matrix. 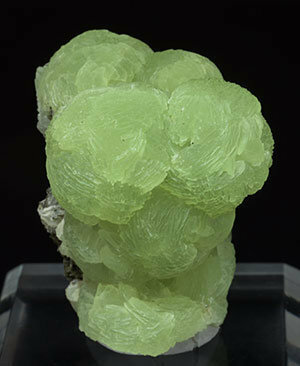 Beautiful globular and fan-shaped growths of Prehnite, of a good green color. Also on the piece are acicular crystals of Augite. 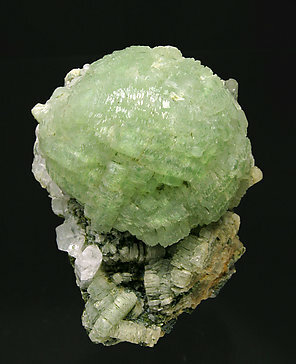 Botryoidal and fan-shaped Prehnite growths with a uniform light green color and on rocky matrix. The quarry has been closed for years. 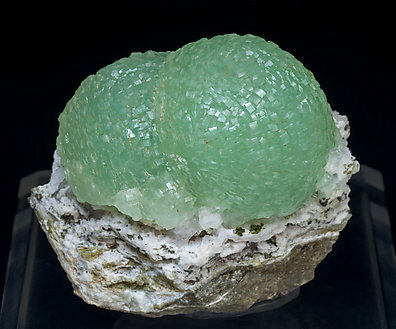 Very rounded, almost spherical, Prehnite crystals with a very clear green color on a surface of transparent and extraordinarily bright Datolite crystals with very well defined faces and edges and on a rocky matrix. A good American classic of which currently circulate very few samples. This piece is from the Tichelman collection (num. 309) whose label we’ll send to the buyer. 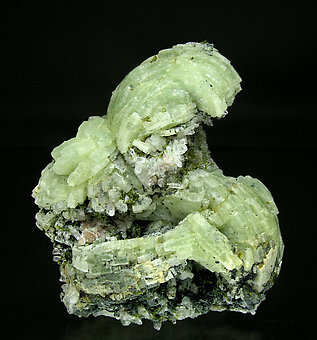 A curved crystal of quality both for its size and sharpness and its detached position on the matrix with small prismatic crystals of Epidote. A classic Alpine specimen. Globular growth of well defined faces, showing a deep green color. 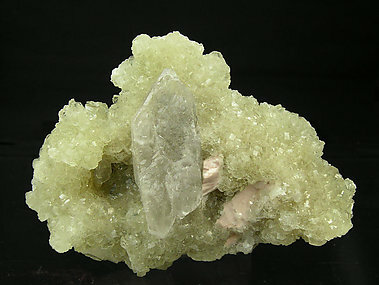 With small Quartz crystals on matrix. 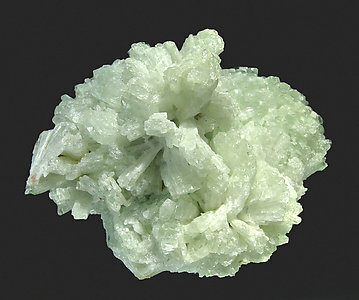 Groups of Prehnite curved crystals forming globular aggregates. On a matrix with Quartz, Epidote and Clinochlore. The specimen is from the James Catmur collection and we’ll send the label with it. Very esthetic piece. 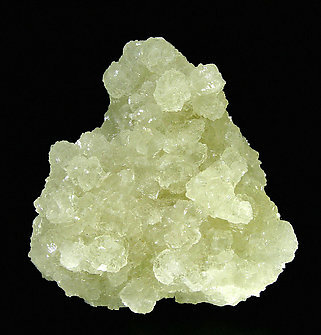 Polycrystalline Prehnite aggregate with very well defined curved faces and edges. 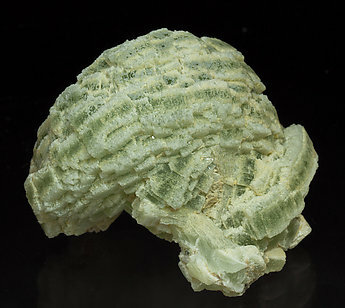 They are bright, have an intense green color and are on a surface of Orthoclase (adularia) crystals with small acicular amphibole crystals coating a rocky matrix. 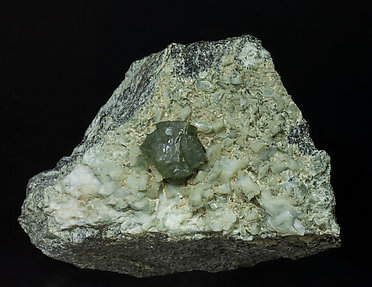 On the Prehnite aggregate there is a small smooth and very white Orthoclase surface. An excellent French classic. Double spheroidal Prehnite growth with very well defined polycrystalline surfaces. 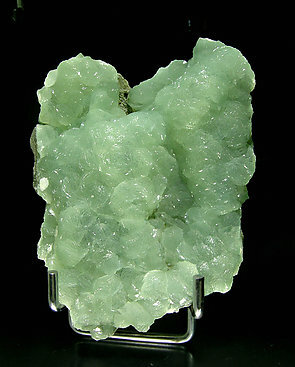 It is translucent, bright with a uniform pale green color and is implanted on a matrix coated by white Quartz. Of high quality, as is usual with samples from the Desmond Sacco collection. 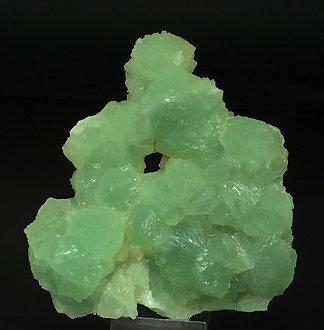 Spheroidal aggregates of crystals with good terminations, a clear and uniform green color and good luster, and on matrix with small Quartz crystals. It is currently difficult to obtain good samples from this mine, as it is actually abandoned. 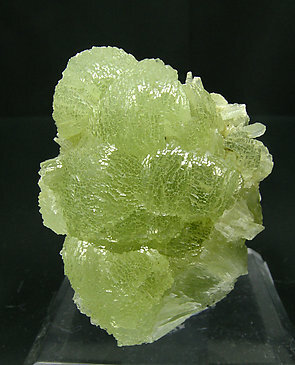 Group of bright crystals of Prehnite with yellowish green color, with a flattened Quartz crystal and small Orthoclase crystals. 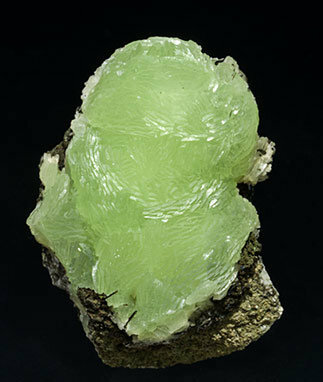 Crystals, defined and closely grouped, have an excellent luster and a pleasant clear color, between green and yellow. 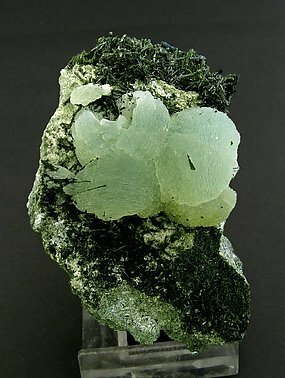 On the back side, around the Quartz, which is the nucleus of crystallization, some fragments of Orthoclase and little acicular crystals of a species in the series Epidote - Clinozoisite appear.